Aluminum fences are built to be strong, durable, and maintenance-free, making them a perfect fencing system solution for any home or business owner. 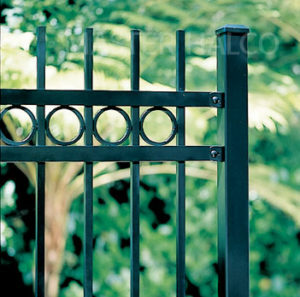 Because of the disadvantages of using iron, those gates and fences you see that you think are wrought iron are almost always made from aluminum or steel. Wrought iron, though extremely popular in another century, hasn’t been used by most fencing contractors for several decades because it simply isn’t as durable as newer materials. With technological advancements and improvements in the quality of alternative fencing materials, there’s no reason to invest in a wrought iron fence again, and nearly all fencing contractors will install aluminum fences, an affordable alternative to a rust-prone iron fence. With aluminum fencing, you can have the look of wrought iron but the strength and longevity of aluminum, which means that your fence will be more affordable, more protected from the elements, and longer-lasting than the real wrought iron fences. The uses of aluminum fences are as diverse as your needs, and you’ll find that an aluminum fence could be the strongest, most durable, and most natural-looking fencing system you can find for your home. Aluminum fencing systems are often used on residential properties to delineate property lines, protect your property, enclose children and pets, and create an “olden day” aesthetic appearance that can set your home apart from the rest. If you’re looking for a way to add character to your home, get your property noticed, and add value to your home, an aluminum fence, whether decorative or used simply for practical purposes, could be exactly the solution you’re looking for. An aluminum fence will require no maintenance, which is crucial somewhere like Minnesota, where the winter weather can leave metals rusted and wood warped, and the sun leaves many materials faded with sun damage. Aluminum fences, though most popular for residential fencing systems, can be installed on both residential and commercial properties. 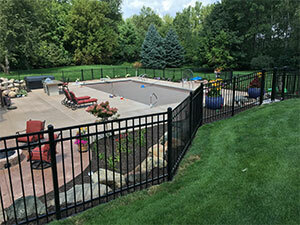 Commercially, aluminum fencing systems are often used to combine the practical uses of durable aluminum with the aesthetic appeal of a more intricate and unique fence design. Aluminum fences allow for easy visibility, making them ideal for fencing off areas that don’t require a privacy fence but need more protection than a standard picket fence or railing. Commercial aluminum fences are often used to block off or limit access to restricted sections of a property, such as business operation areas, pools, and limited-entry parking lots. Aluminum fences are often used to outline property lines, surround or outline waterways, and create defined pathways as well. These fences are also popularly used in amusement parks to create waiting areas for lines and restrict access to dangerous areas, such as the inaccessible areas of rides, which should remain off-limits but visible. Although you might think that aluminum fences with the wrought iron look have gone out of style, you’d be surprised how frequently we install commercial and residential aluminum fences. Because aluminum fences are versatile in their styling and are extremely durable, they’re often a perfect fencing system to meet the functional needs of a fence and the stylistic demands of property owners. 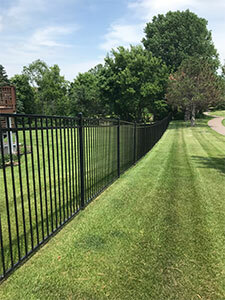 Whether you’re looking for an ornamental aluminum fence or a standard fence that will be effective in keeping your property safe, the fact is, aluminum is a long-lasting material that any Minnesota home or business owner should seriously consider. With aluminum, your fence can be as simple or intricate as you’d like, with a variety of fence styles to choose from that can make your fence stand out or blend in as much as you’d like. 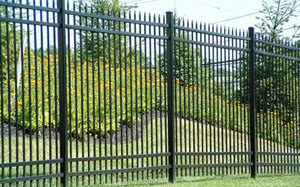 The beauty of aluminum fencing systems is in the subtlety of design. Very few people will stop and stare at a plain fence, but with the slightest change, you’ll find that an ornamental aluminum fence can draw as many eyes as your entire property. At Twin Cities Fence, we offer a large selection of aluminum fencing designs and styles, which means that your fence can draw as much attention as you’d like, blending in to your property or functioning as a crucial element of design. With spear top and staggered spear top styles, universal top (flat top) and universal spear top selections, and even picket style aluminum fences, you’ll be sure to find a style that suits your needs, complementing your property’s design or simply functioning as a fence should. 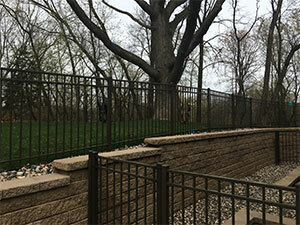 For an aluminum fencing installation company that has simple and decorative aluminum fencing styles, contact Twin Cities Fence at 612-443-1948 or contact@tcfmn.com, and find out how to get that wrought iron look with a longer-lasting material.